Delicious crisps made with rice, flavoured with authentic and enticing tastes of Asia. 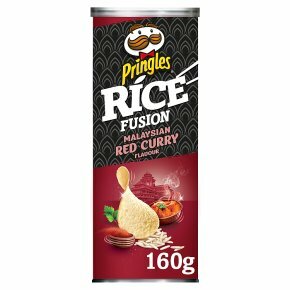 Eat your way East with NEW PRINGLES Rice Fusion Malaysian Red Curry rice based crisps. Aromatic curry spices of turmeric, cumin, coriander and ginger blend with sweet coconut. Explore the diverse and complex flavours of Malaysia, without leaving home. PRINGLES iconic can made for sharing, with re-sealable lid to lock in the fresh flavours. NEW PRINGLES Rice Fusion, bring a fusion of oriental flavours to your snack times. Vegetarian. Get ready to explore a taste adventure like no other with NEW PRINGLES Rice Fusion Malaysian Red Curry. Deliciously irresistible crisps made with rice and flavoured with the authentic tastes of Asia. Indulge yourself with a blend of exotic curry spices of turmeric, cumin, coriander, ginger, garlic, cinnamon and cloves, combined with sweet coconut for a deliciously aromatic taste of Malaysia. Pure, enticing flavours bursting through every crisp for an intense flavour experience that lasts - every mouthful taking you further into your Eastern adventure. Step foot inside the world of Eastern flavours, without stepping foot outside your front door. Eat your way East with NEW PRINGLES Rice Fusion Malaysian Red Curry. At PRINGLES, we want to ensure your snacking experience is a new, spontaneous, tastebud-tingling adventure with every flavour. So, we developed Rice Fusions, deliciously irresistible crisps made with rice. Rice is the perfect carrier of flavours, it absorbs and holds the pure flavour evenly throughout the whole crisp. The thin and bubbly texture of the rice crisp means the full intensity of flavours shines through quickly and lingers to the very last crumb. Pure, enticing flavours, thin and crispier texture, and intense aromas - start your flavour adventure here and explore NEW PRINGLES Rice Fusions, the authentic tastes of Asia. For all the travel hungry social explorers out there, join the voyage of taste exploration. Indulge your senses with an Asian flavour experience so authentic you'll be transported to the East. NEW PRINGLES Rice Fusion has 4 exciting flavour combinations: Peking Duck with Hoisin sauce for a rich and sweet fusion; Malaysian Red Curry with aromatic and fragrant curry spices; Japanese BBQ Teriyaki with warming pungent ginger; and the mildly spicy and aromatic Indian Tandoori Chicken Masala. Where will your flavour adventure take you?